We’ve been holidaying in Cape Town and the sun has been shining throughout. It’s autumn here now and the locals tell us it’s really unseasonably warm at 27C in the day. Sunsets are glorious in Cape Town and we are so fortunate to be staying in a nice little spot where we can see the sun waving daylight away from the little balcony. 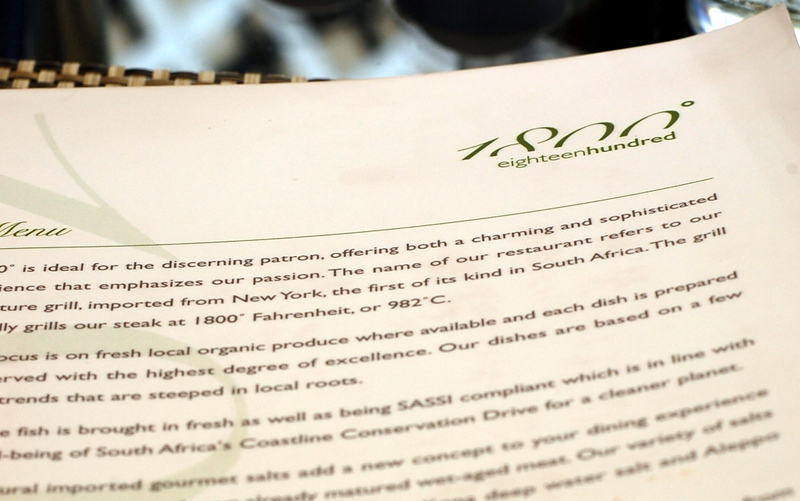 We like to explore a country through its cuisine and have been noticing a nice little restaurant and grill called 1800°, just round the corner from where we’re staying in Green Point. It’s part of a development which houses a luxury hotel and high-end residences, and apparently one of the hottest clubs in town at the moment, ZAR. The name of the restaurant refers to its signature grill which literally grills its steaks at 1800° Fahrenheit. 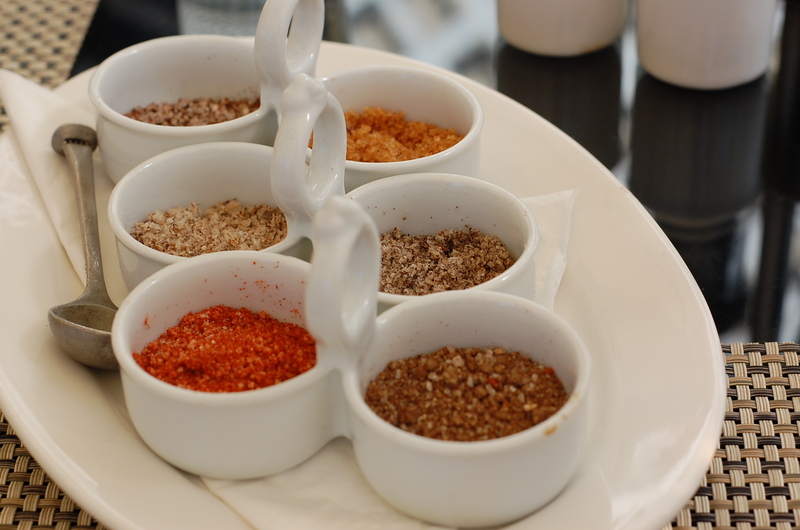 A noted speciality of this restaurant is its selection of imported, hand-harvested gourmet salts which is served with your meal. They come from around the world and include salt with smoked paprika, truffles, pepper, thyme and rosemary, a damp salt and another variety I can’t remember. The menu is simple with a focus on meat and seafood. We skipped starters and went straight in for the meat feast. 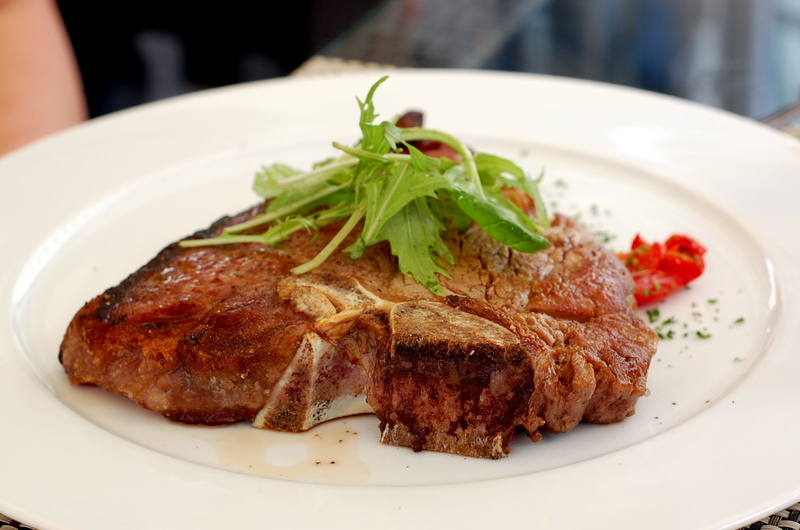 K enjoyed a t-bone beef steak, the meat was juicy, tender and cooked to his order of medium rare perfectly. 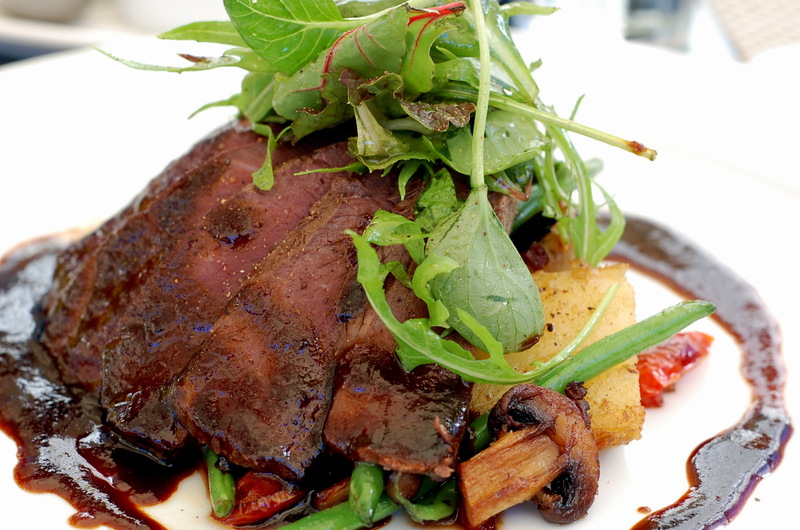 For the first time ever, I had a grilled loin of springbok served with fine beans, potatoes, tomatoes and mushrooms, together with a jus that tasted a little like a soy reduction. The springbok meat was lean but tender, not chewy at all. Yes, it tasted gamey but not overly so. There is no dessert menu for you to choose your sweets from. Instead, a platter of the desserts on offer is presented and introduced. 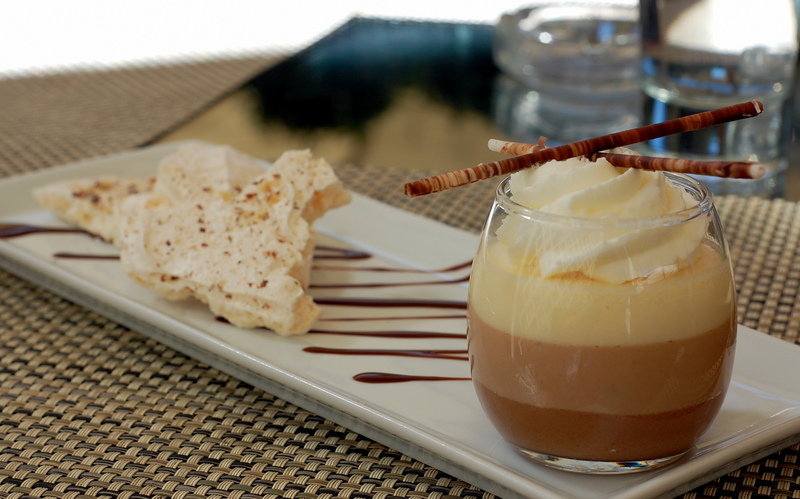 We chose a chocolate mousse which came with a few broken bits of meringues and an orange infused caramel custard garnished with a couple of gooseberries and a think buttery piece of biscuit. It was lovely sitting in the shade, outdoors. We enjoyed a bottle of chilled organic rosé, a 2009 Avondale from the area of Paarl, South Africa with our meal, then coffees with our desserts. Service was courteous and as it wasn’t very busy, our waitress took the time to chat to us. As with most other places we’ve been to, service in SA is generally very friendly, and I feel that our enjoyment of the meal really means something to the staff. They are not just here to do a job, they want to do it well. It’s a matter of pride – and I think we all need a little bit of that everywhere in the world. Price for plates as above including an optional service charge came to ZAR600 which is about £60. 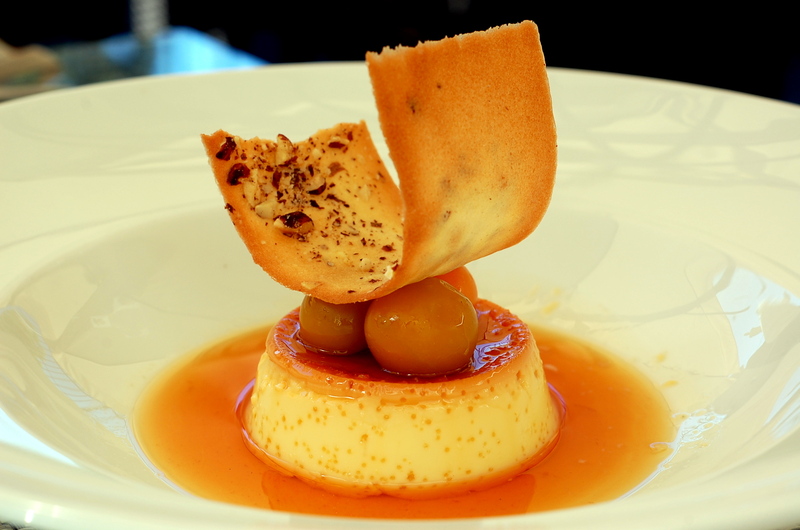 1800° is located at the Cape Royale Hotel and Residences, Main Road, Green Point, Cape Town, South Africa. ← Weekends are for… eggs Benedict!